I found myself with two packages of spinach, I used one of them to make this recipe for Easy Sauteed Spinach and Carrots. This recipe is so simple and takes no time at all to prepare. Healthy and delicious, the best of both worlds! My friend Alex was going on a vacation and cleaned out her fridge of all of the perishables. They ended up here! We couldn’t believe how much food was in the two shopping bags she brought over! I was wondering why she had so many fruits and vegetables in her fridge right before she was going away when she blurted out that she forgot she was going on vacation and just went shopping as per normal. We both had a laugh, she hugged me and left to prepare for travel! With four boys, under the age of eleven, who couldn’t understand? 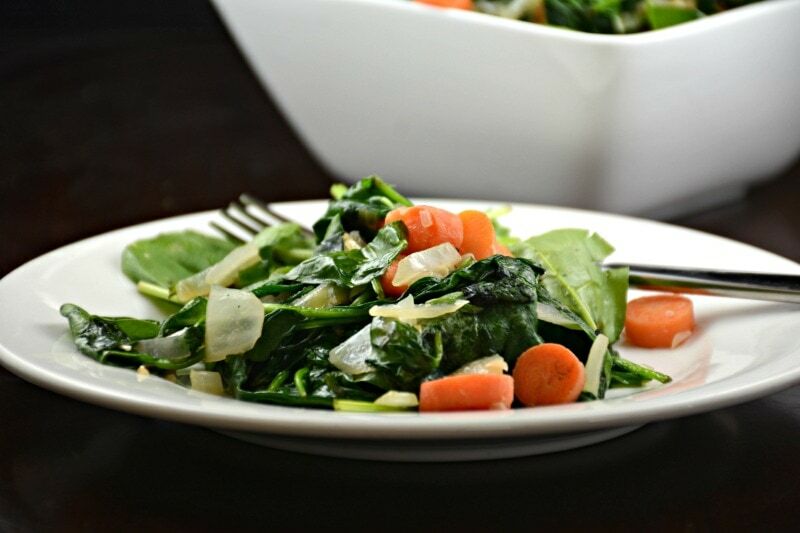 This Easy Sauteed Spinach and Carrots recipe is now a tried and true favorite around here and has been my go to vegetable side dish for sometime now. The serving bowl is always empty by the end of the meal! 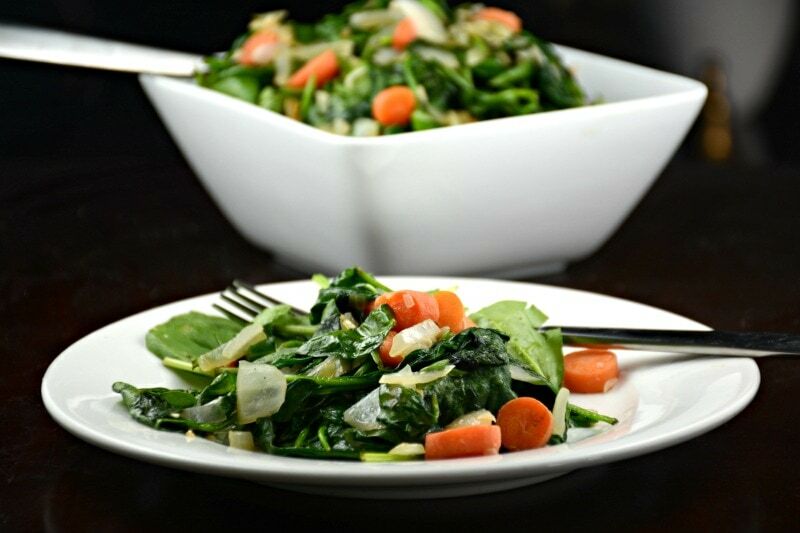 It is a simple and flavorful dish and spinach and carrots pair so well with most any main course. The simple flavors in this dish are perfect. I love the flavor of the spinach sauteed in onion and garlic. Carrots add the perfect amount of sweetness. Now I am making myself hungry! This Easy Sauteed Spinach and Carrots recipe also contain simple ingredients that you probably have in your refrigerator and pantry right now! That’s why I love it! When you know what main course you are serving and you are trying to think of something quick and healthy to serve with it. Easy Sauteed Spinach and Carrot recipe is perfect! 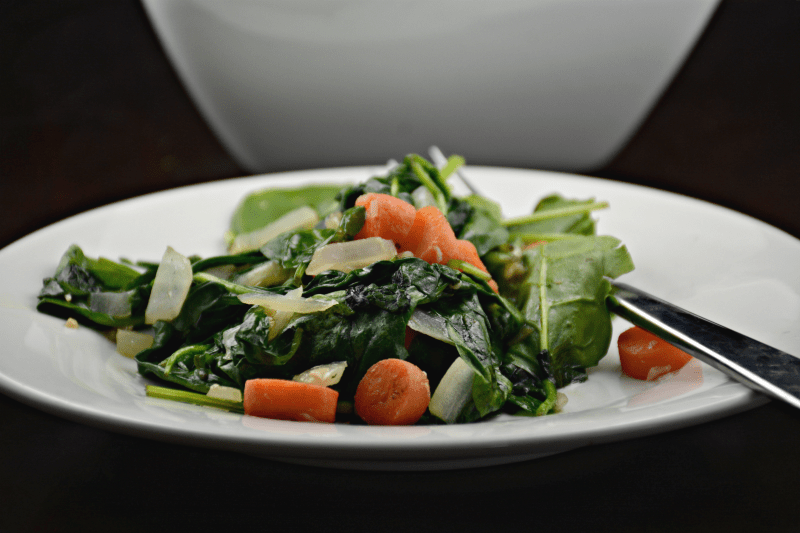 Hope this Easy Sauteed Spinach and Carrots recipe is a tried and true winner for you and your family! In a large skillet preheat your oil until it shimmers or a drop of water flicked in it dances, over medium to medium high heat. Add carrots and saute` for 3 or 4 minutes. Add onion and stir until tender, another 2 or 3 minutes. Add garlic and stir for another 30 seconds or so. Last, add your spinach and stir until wilted, another minute. Great ! Use fresh spinach. Sooooo good especially if you add chilli flakes and almonds.